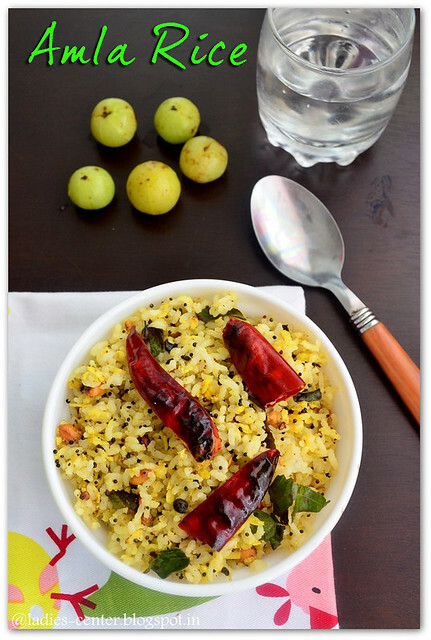 Amla rice(Nellikai Sadam) is a healthy one pot meal and one of the simple to make gooseberry recipes which can be packed for lunchbox. If you think that the taste of amla rice will be bitter and your family members will not like it, you are wrong. I made it for my kid and me for lunch one day. He ate it well. The ratio of cooked rice and amla should be correct to avoid the bitterness. As you know amla(Nellikai) is very good source of Vitamin C and it is good for you and your hair as well. 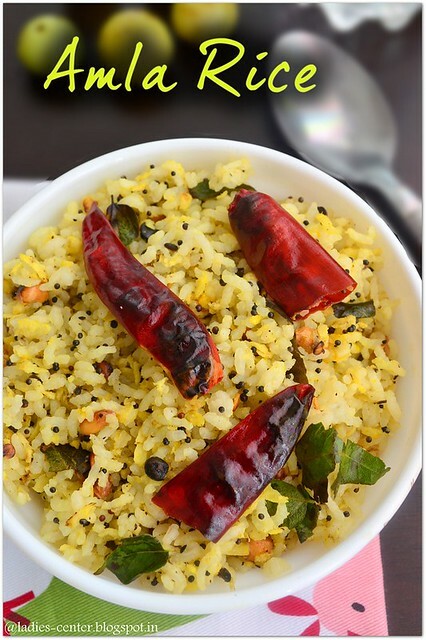 Amla rice recipe which I have shared here is very simple and easy to make. Grating amla takes very less time. I have cooked the rice with water in 1:2.5 ratio. You can adjust according to your rice variety. Once you try this recipe, you will make it so frequently. Let us see how to make amla rice now. 1. Cook the rice in a way that the grains can be separated. 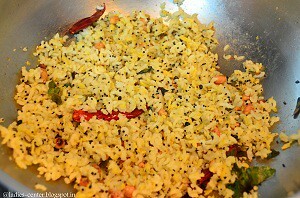 Spread it on a plate and fluff it with a fork to separate the grains. 2. Wash amla and grate it in a grater. Discard the seeds. Keep it aside. 3. Heat 1 tbsp oil in a pan. Add mustard seeds. Let it splutter. 4. 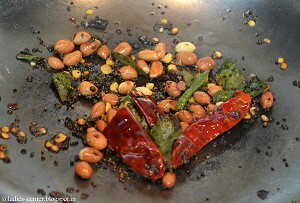 Add urad dal, bengal gram, penuts, red chillies, curry leaves and hing. Saute till they turn golden brown color. 5. Add grated amla, turmeric powder and salt. Saute till the amla pieces shrink and cooked. 6. 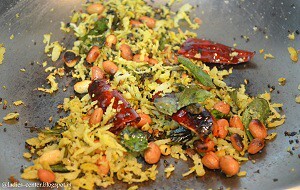 Add cooked rice to the pan and mix well till the rice is well coated with the tempered items and amla. Adjust salt if required. Switch off the stove. 7. Mix sesame oil if required to get a nice flavor. Cover it for 3-5 minutes. 1. Adjust the quantity of grated amla depending upon the bitterness of amla and your personal preference. 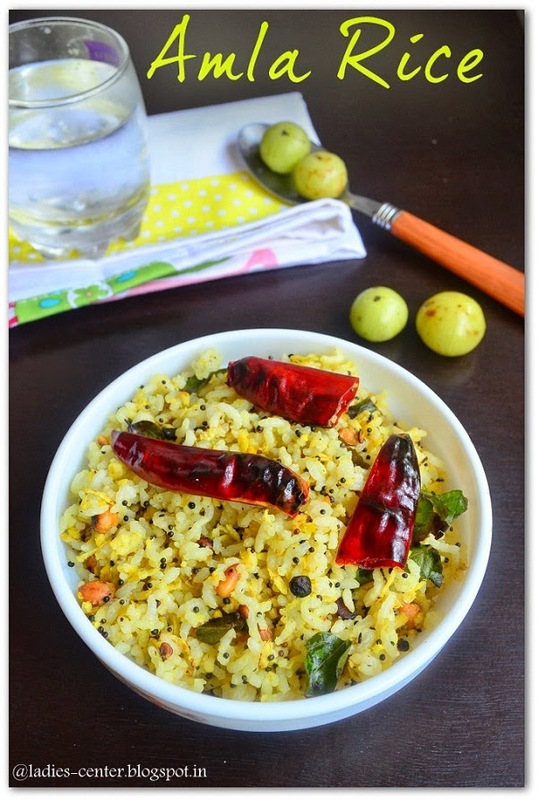 Since Amla rice recipe is a very easy one, there is no other thing to be noted. You will get a perfect amla rice. Hope you liked the amla rice recipe.